new inventory Blog Post List | Bud's Chrysler-Dodge-Jeep, Inc. The Dodge Durango continues to be a popular mid-size SUV. At Bud's Chrysler-Dodge-Jeep, Inc., we love showing off all of the great features, including some of the packages that you can look forward to getting. The Brass Monkey package will add a glossy paint job as well as a gloss on the grille and badges. You'll also have 20-inch burnished bronze-colored wheels that help to give the package its name. There's a sportier exterior appearance, especially with the black headlamp bezels. A Beats Audio system and a sunroof will also come with the package. As one of the more popular SUVs on the market today, the Jeep Cherokee continues to deliver. As a mid-size vehicle, there's plenty of storage space and room for your passengers to be comfortable while traveling. The u-connect system makes using technology easy while driving the Jeep Cherokee. Enjoy the memory features in the Cherokee, which make it easy for more than one driver to have a great driving experience. With the touch of a button, the memory system will set your seat, radio station and exterior mirrors. A full-size luxury sedan offers car buyers some of the most incredible technology features that the automotive industry has to offer. That is why our team of automotive experts here at Bud's Chrysler-Dodge-Jeep, Inc. is so excited to announce the arrival of the all new Chrysler 300! The Chrysler 300 offers a sound system that will allow you to hear your favorite music like never before. The available 19 speaker system will let you play your favorite tunes or listen to your favorite podcasts on your way to work in the morning. The Dodge Challenger is a superior muscle car and a popular model among drivers that come to Bud's Chrysler-Dodge-Jeep, Inc. This model is offered in a number of trims and comes equipped with exceptional performance features that increase power and efficiency. Four available engines power the Challenger. The base engine is a 3.6L Pentastar V6 engine that is capable of 305 horsepower, and the 5.7L HEMI V8 engine offers up to 25 highway mpg and can generate 375 horsepower. The Challenger also offers an available 392 HEMI engine that can produce up to 485 horsepower. Starting at $27,945, the Jeep Wrangler JK is an ideal SUV for those who want superior capability. At Bud's Chrysler-Dodge-Jeep, Inc., our team understands SUVs. We think that the Wrangler JK is an outstanding model. It is a popular choice among consumers because of its capability features. The Wrangler JK offers four available 4x4 Systems. The Selec-Trac 4x4 System comes with a full-time mode that can switch from two- to four-wheel drive based on driving conditions. 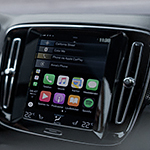 Ride and Drive an Apple CarPlay Vehicle at Bud's Chrysler-Dodge-Jeep, Inc.
Apple CarPlay is the future of smartphone/vehicle phone integration. This handy software and hardware combination allows Apple iPhone owners to use their phone to interact with their vehicle. While similar features have been available in cars for more than a decade, it is only recently that economy models are starting to see the installation of Apple CarPlay as a standard feature. When the all-new Ram ProMaster arrived here on the lot at Bud's Chrysler-Dodge-Jeep, Inc., our team members knew we would have to pass on some information to local motorists. This popular cargo van comes with a number of important durability features that are making hauling your work related supplies easier. 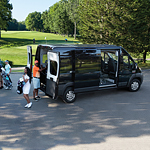 There are many options that you have to choose from when it comes to family-friendly minivans. The 2018 Dodge Caravan is a top choice with consumers because it comes with technology features that are among the best in its class. 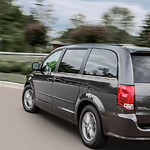 If you want to find out additional information about the 2018 Dodge Grand Caravan, read about its technology features below.